These services are available to all domestic and commercial clients. We tailor our services to each specific job. However, we bring our professional approach and vast experience to each. This ensures that the project is completed in a timely manner. This avoids as much disruption for our clients as possible. 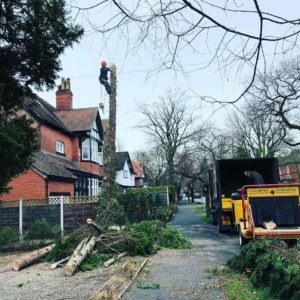 This is a tree removal project in Bramhall, Stockport. The first image shows how incredibly tall the tree had become. 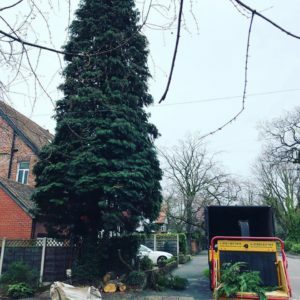 It was now unmanageable for our clients and their request was to bring it down safely. What to consider for tree removal? There are so many considerations, but the major ones are all based around safety. We successfully removed the large tree. The images show the process to which this happened and the result we achieved. All of the material is taken away, unless our clients request us to leave it. 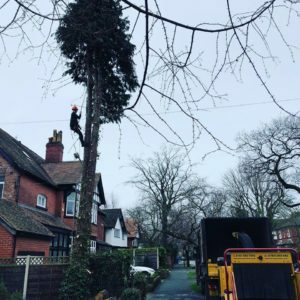 It is our aim to ensure the smooth running of the tree removal process. This is both before the work starts, during the work and once the project has been completed. We offer ongoing customer care, and this has formed a huge part of our business over our many years. Building a respected local reputation is absolutely paramount. 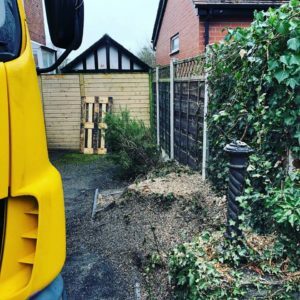 If you have any questions about our tree surgery services or would like to request a quote for tree removal, please call today on 07855 859983. We offer a free, no obligation quotation process and are happy to answer any questions you may have.